Jay Cutler and Brandon Marshall celebrate their three TDs. 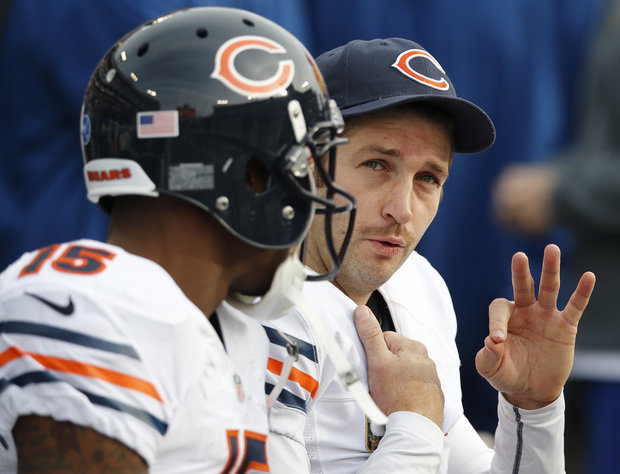 Jay Cutler and Brandon Marshall connected for three TDs. The Bears didn’t fiddle around in their dismantling of the Tennessee Titans 51-20. The first quarter alone was a record setter for the franchise scoring 28 points, the defense overwhelmed their opponent - on the road. With half the season finished, this Bear team is now 7 and 1 and remains on top of the NFC North division. -The spotlight of the game has shone the brightest on Charles Tillman. He led the Bears with nine tackles and forced four fumbles-four in one game. Three were recovered by his teammates, as Tillman continues to be relentless punching the ball out of the receivers’ hands. With his seven on the season and winning the "NFC Player of the Month" honor--Tillman has become a force to be reckoned with in the league. He has always had the skills; they were honed under the tutelage of Lovie Smith. Injuries at inopportune times have bothered him some seasons and several years when the Bears struggled with their pass rush and his cornerback play suffered the consequences. Now he is the toast of the NFL. -The old-injured Bear that had some nice highlights was Brian Urlacher. He had a five tackles, forced a fumble and grabbed an interception from Titan&apos;s quarterback Tim Hasselbeck. Despite a knee that is not one hundred percent, Urlacher lumbered down the sidelines scoring on his pick. That touchdown was the seventh for the Bears defense this season, two away from the NFL record with half the season to play. -Pro-Bowl running back Matt Forte had huge plays for big yards and plays with great results. In that impressive first quarter, Forte had an 8-yard touchdown run with the Bears offensive line forcing him over the goal line. Forte also scampered 47 yards on a screen play (they should do that more). In the second half, a 46 yard run by Forte was instrumental in a drive netting a 25 yard Robbie Gould field goal. Matt Forte had 12 carries for 103 yards and a touchdown for the game. -Special teams deserve a nod too, after a Wildcat play that featured two players from Northwestern. In the first quarter, Sherrick McManis blocked a punt and his former college teammate Corey Wooten scored a special teams’ touchdown. Devin Hester was oh-so-close to scoring on a punt return; Tennessee resorted to a "horse-collar" penalty in stopping the league&apos;s best return man from getting into the end zone. The Bears are hoping Hester will become more of an impact with his returning skills as the season continues. When Brandon Marshall dwarfs the man covering him, it is a total mismatch. Bears QB Jay Cutler took advantage of his favorite receiver’s height and they connected for three touchdowns, the most ever in a game for Marshall. For the fourth time this year, he went over a hundred yards-Marshall had 122 yards on nine receptions to be exact. Cutler was efficient going 19 of 26 for 229 yards and 3 touchdowns; his one blemish was the fumble during a sack. -It is hard to nit-pick when a team scores 51 points, but the schedule is heading to a more elevated level opponent. Yes, the Bears defense sets the tone and it has spilled over to aid the offense. However, the Bears offense continues to struggle at times; the win will overshadow the spotty play by the offensive line. Dumb penalties have to be corrected; they continue to have false starts. They have to protect Cutler. It is very hard to see the offensive line use “max” protection (extra help) and it is not enough to help. -One of the greatest positives for a big win, the starters were able to get off the field and the back-ups got to see action. With the back-ups, the Tennessee had their only big offensive play when Chris Johnson ran for an 80-yard touchdown, it hurt the overall numbers-not the outcome. As the game concluded, there were smiles on all the Bears, even stoic Lovie Smith was grinning. The team will enjoy the game for a day or two and then it will be preparing to host a very talented AFC team from Houston next Sunday night. That is going to be great match-up.